For readers who see patterns in things, by now regular subscribers to the veganized treats journal will have recognised a definite propensity for big hot bowls of comfort slops. You pretty much don’t ever see that description of food in Gourmet Traveller, but right here, as Autumn hits and along with it the need to curl up by a fire with a belly full of goodness, our recipe today plays all the right notes. First up, a word on congee. I love it, and it is to me a beautiful neutral palate to make tasty and textured. Some folks don’t love the consistency of congee, but all I can say is don’t knock it till you’ve smashed a bowl into your rice hole. 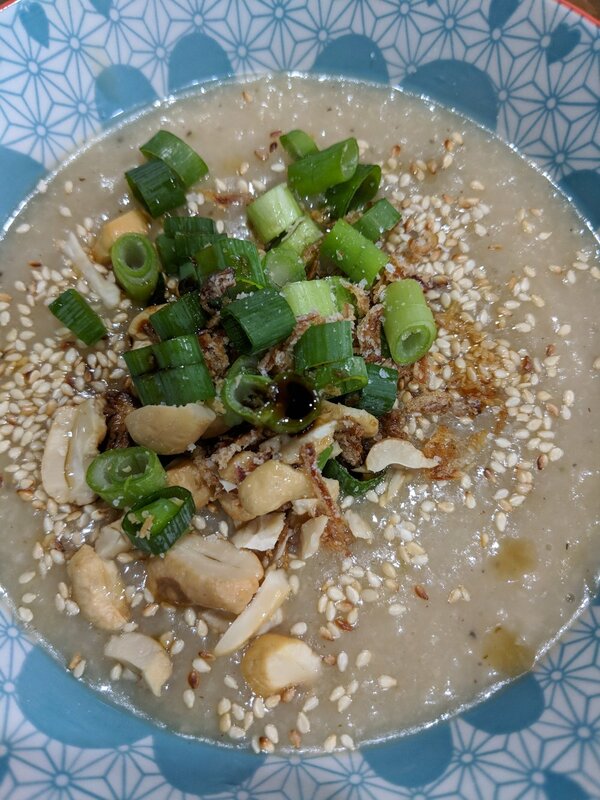 This congee is what they call in yoga ‘sattvic’ which basically means it is designed to Ayurvedically be super good for you, and operate at your highest frequency. I love Ayurveda (check the journal soon for a longer post on Ayurveda and the Gunas) but no matter how good it is for you, it still has to taste awesome (and it does). The use of asparagus, ginger and black pepper is divine, and has all the right heating notes to get the body warmed from the inside out. If asparagus isn’t in season, you could head for whatever fresh greens are – broccoli, rabe, peas, all of those would also be awesome here. If you want to have some fast love, you can give the rice a quick whiz in a food processor (and old grinder will do) which means it will cook faster, and break down into a creamy ricey slops. If you want to go pressure cooker that will work too. Congee is 50% slops, 50% condiments, and this is where the texture and punchy flavours come in. You can use any combination of the below, or play your own topping game. If you want to keep it sattvic, then avoid onion, garlic and chili. Boil the stock and add the rice and pepper. Cook until the consistency is a thick soupy ricey mass and the rice has broken down significantly. Add the asparagus and ginger and cook until the asparagus is tender, about 5 mins. Check for salt and add to taste. Serve in deep bowls with condiments of your choice to flavour. Eat and lie on the ground, hugging your tummy.